The Rotary Club of Lethbridge East met at Mike and Diana Greer's home to celebrate the end of a great Rotary year. Activities included: "Pass the Gavel" to the new co-presidents Chris McLean and Fran Leggett, a welcome back to Canada to last year's outbound exchange student Coral Skiba and a last chance to say farewell to this year's inbound exchange student Linette Kux. There was lots of great food and fellowship. Many thanks to Mike and Diana for hosting this event. Above: Rotary Club of Lethbridge East and exchange students Coral Skiba and Linette Kux behind the flag. Coral Skiba (left) has recently returned from a year in Austria. Linette Kux will be returning to Austria in July after a year in Lethbridge. Linette Kux receiving gifts. She sure liked her moccasins and Tshirt. We're trying to make her as Canadian as we can before sending her home. Left to right: Chris McLean and Fran Leggett (incoming co-presidents), Audrey King (outgoing co-president) and Linette. Audrey King getting ready to pass the gavel to Fran and Chris. 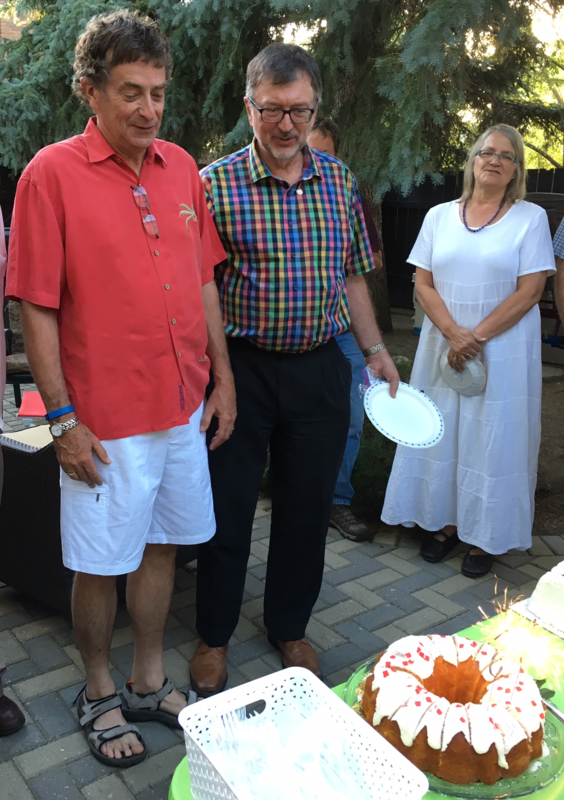 Mike Greer, our host, was also celebrating his 65th birthday. Mike (left) with Roger Rampling and Cheryl Mains.